JP 2012-10-31 ¥286 (300) ? 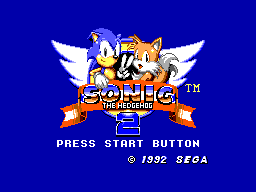 Sonic the Hedgehog 2 (ソニック・ザ・ヘッジホッグ２) was made in Japan by Aspect Co. Ltd for the Sega Master System and later ported to the Sega Game Gear. Even though it shares its name with the 16-bit version of Sonic 2 for the Sega Mega Drive, it is not a port, as it contains entirely different levels. It was released slightly before its 16-bit namesake, making this game host to the first appearances of both Miles "Tails" Prower and Mecha Sonic. The Game Gear version contains noticeable differences from the Master System version. The changes made in the portable version give it a reputation of being one of the hardest Sonic games in existence. Some choices appear to have been intentional, by design: for example, the boss music is different and some boss areas have different layouts. However, many of the difficulties in the GG version result from its smaller screen and its scrolling: the player is left more open to being hit, in a way that some might label 'cheap', due to not being able to see obstacles and enemies around them but beyond the range of the screen. The scrolling is the same in the Master System version, but it is not as big a problem as more of the surroundings can be seen. Strangely, Tails appears in every title card and has an almost complete sprite sheet, but is only seen in the opening and ending cutscenes, as well as being depicted helping Sonic on the box art. It is possible that he was originally intended to be a playable character, but was cut for time issues. Sonic the Hedgehog's friend and sidekick Miles "Tails" Prower has been captured by his nemesis Dr. Robotnik on South Island, and the player must direct Sonic to retrieve Tails and the six Chaos Emeralds. In the good ending, achieved if Sonic acquires all the Chaos Emeralds, he stops Robotnik and frees Tails. In the bad ending, if Sonic has failed to obtain all the emeralds, Tails is not shown to have been rescued. Some fans have speculated that Tails might have died in the latter case. This game improved upon its 8-bit predecessor in many ways. This includes the ability to grab back rings scattered when hit by an enemy, as well as being able to smash through certain walls. Moreover, one of the major difference from its predecessor is its speed: Sonic 2 is faster than its prequel and is closer to that of the Mega Drive games. However, the Spin Dash from the 16-bit version of Sonic 2, a move specifically designed to provide speed, was not implemented; but this may be simply because the 8-bit version was released earlier. Uniquely, this game includes levels in which Sonic must ride a mine cart (unique until Sonic the Hedgehog 4 Episode I, at least) and a hang glider. Other new items include large bubbles in underwater levels, which raise Sonic upwards until he hits a ceiling, enemy, or obstacle. Sonic is also able to skim across the surface of water if he picks up enough speed. There are seven Zones in total, each comprising three Acts. In the final act, that Zone's boss is faced, without any rings to grant protection against attacks. Rather than facing Robotnik himself, Sonic most often battles robotic animals, such as a sumo pig and a circus sea-lion. Dr. Robotnik: no prize. This panel comes up most often. Ring: Ten rings are added to the player's ring tally. This is obtained by finishing the Act, i.e. passing the panel, with a ring count that is a multiple of ten. Sonic: extra life a.k.a. 1-up. This is awarded if the player finishes the Act with exactly two lives less than when s/he started it.. Tails: Continue. This is awarded if the player finishes the act with 77 rings and with exactly the same number of lives as when s/he started it. Item boxes, as in all the classic 8- and 16-bit games, resemble monitors. The items offered in Sonic 2 are largely the same as those in its prequel, although the restart marker and shields have been removed. Chaos Emeralds are scattered throughout the stages. Each is found in the second Act in each of the first five Zones. If the player collects these and then destroys Mecha Sonic (called Silver Sonic in the English manual) in the sixth zone, they will obtain the sixth Emerald and can access the true final stage (Crystal Egg). This is required to obtain the 'good ending'. If all the Emeralds are not collected, the game will end after Mecha Sonic's destruction. Many levels also contain a unique method of transportation, such as the mine carts in Under Ground Zone (revisited many years later in Sonic the Hedgehog 4 Episode I), the hang gliders in Sky High Zone, and the giant air bubbles in Aqua Lake Zone. The Game Gear version has a lower screen resolution. The music for Scrambled Egg Zone plays during the prelude cutscene, and the title screen has the music that was played in the prelude in the Master System version. The prelude cutscene is more detailed in the Game Gear version, showing Tails walking along and then getting kidnapped. Different music is used for the boss battles on each game. The Doodlebug Mecha is more difficult due to the Game Gear's lower resolution: you cannot see the bouncing balls coming from as far away as you would on the SMS, and the speed and bounce height of the balls is randomized in the GG version. In the Game Gear version, the water in Aqua Lake Zone Act 2 is now a dark blue instead of green. Moreover, the Speed Shoes present in the SMS version are omitted and replaced with a Super Ring item. The rising water in Act 2 of Aqua Lake Zone is missing from the Master System version. Green Hills Zone's boss battle takes place on a steeper hill, and the escape chute cannot be seen while fighting Robotnik in the final zone. The ending music is different: the Master System game uses a sad sounding song in both endings, whereas the Game Gear version uses more upbeat music for the good ending. Strangely, the Master System's version does contain the upbeat music in the ROM but never uses it.